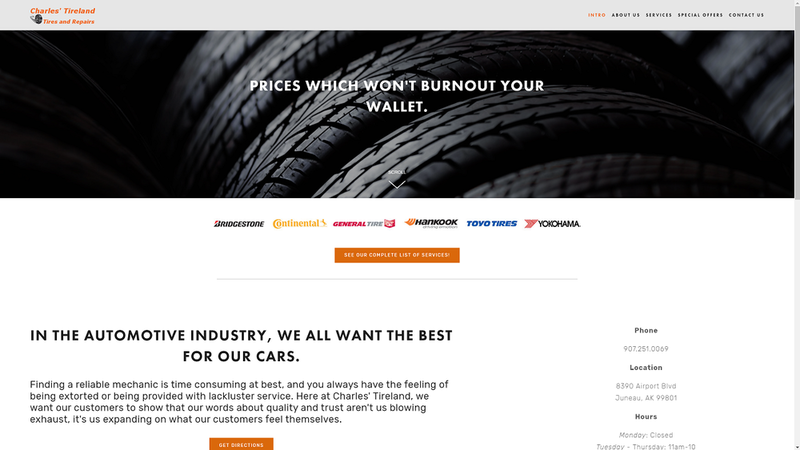 Charles' Tireland is an auto shop mock-up website. We wanted to show general automotive businesses what a website designed for them might feel like. Those who go with the design shown with minimal changes can expect a significant discount due to the fact that most of the design work is already done. We still teach the client everything there is to know about their new back-end as well as how to update any content. Of course, our monthly post-completion support is still included. The majority of automotive shops, regardless of being repair, restoration, or otherwise, are generally only a word-of-mouth market. Our aim is to help auto shops garner stronger local opportunities, as well as the online market for the applicable shops (such as ones who restore parts and ship them out). The majority of auto websites are severely outdated meaning that updated sites hold a strong impression on potential clients. Here we continue to stress how important it is to our customers that their mechanics be experts with a rich history. Giving a story to a shop increases the attractiveness to customers, so we told the story of how the owners opened up. Presented the information needed to locate the shop almost instantaneously, as well as know when the shop's open. Implemented buttons which addressed the most commonly asked questions by the general population when searching for a mechanic/auto shop. Stressed to the customer that the shop has a positive history with their consumer base on multiple pages. For an auto shop website, we decided that we wanted to create shorter page lengths, which would compartmentalize all of the information that customers could potentially seek. Doing this allows the website to subtly portray a business which is ready to be challenged by the best in its area by any potential customer. We aimed for customers to be able to quickly locate the shop and all necessary information such as hours and services. Customers' concerns or hopes are addressed by including testimonials from various, real customers in the front page itself. The website continuously engages customers with a level of personality, which isn't standard within the automotive's online community, building trust that the shop is more than simply another business aiming to take the consumer's money.